Whenever you start talking about recognizing nonhuman animals as legal "persons" who have certain basic rights (like the right to bodily liberty and bodily integrity), some sarcastic wiseass pretends you're trying to give dolphins or chimpanzees the right to vote or to drive a car. Interestingly, however, this does raise the question of how animals vote in their own social groups, and to what extent the animal "kingdom" is, rather, an animal democracy. The answer is: It's a lot more democratic than most human societies. One common property we see in animal groups from schooling fish to flocking birds to primate groups is that they effectively vote to decide where to go and what to do," Couzin says. 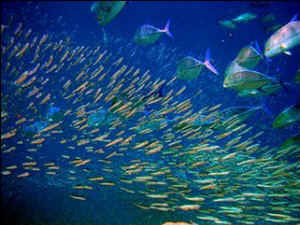 When one fish heads toward a potential source of food, the other fish vote with their fins on whether to follow. And this highly democratic process helps animals make decisions as a group that are better than those of any single member. Successful animal leaders know they can't get too far ahead of their constituents. They seem to simply reconcile their own goal-oriented behavior with this tendency to align with others," Cousin says. "Because if you don't tend to be influenced by others, you then leave the group behind, and you may get eaten by predators, or you lose the benefits of group living. In chimpanzees, it's not necessarily the physically strongest individual who seizes the control over the group," van Vugt says. "It's usually the more cunning individual, someone who forms his coalitions well. Which is, of course, exactly what we've been seeing in the current election cycle â€“ particularly from Mitt Romney, who, true to his species, has shown one face to one group and then another one altogether to a different group, and then, "etch-a-sketching" his way to yet another new position on almost every issue, has ended up managing to appeal to the greatest â€“ and the most gullible â€“ number of people. 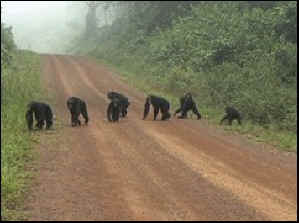 That's classic chimpanzee troop behavior. Elephants do it differently. Unlike chimpanzees and humans, who, van Vugt says, are both "accomplished liars", there's nothing especially deceptive about the voting process among elephants. The de facto leader is usually, but not always, the oldest female. "When the group is attacked, it might be one of the dominant male members who takes control," he says. "But when it comes to knowledge problems and particularly where to find water, they turn to the oldest female." This is something that is particularly unusual in animals. Normally dominance is the main element in leadership in dogs, macaques, chimpanzees and many more. What we find in elephants is it more about their ability to get agreement. Leadership is not equal to power or assertion in elephants, but illustrates the respect accorded to individuals as a function of their problem-solving ability and their social permissiveness. The interesting thing about it is in the signaling of the scout bees, there is no deception whatsoever, van Vugt says. They want to do what is best for the hive. And I think that is a little bit dissimilar to humans. 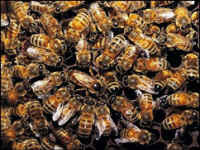 The bees' system is not infallible â€“ nor is that of any other animals. But if they get it wrong, they can switch track a lot faster than we humans. And if the bees, the fish, the migrating birds or any other animal took more than two years out of every four to decide which direction to vote for, they'd all have gone extinct millions of years ago! Â© 1998-2012 The Mary T. and Frank L. Hoffman Family Foundation. All rights reserved. May be copied only for personal use or by not-for-profit organizations to promote compassionate and responsible living. All copied and reprinted material must contain proper credits and web site link www.all-creatures.org.